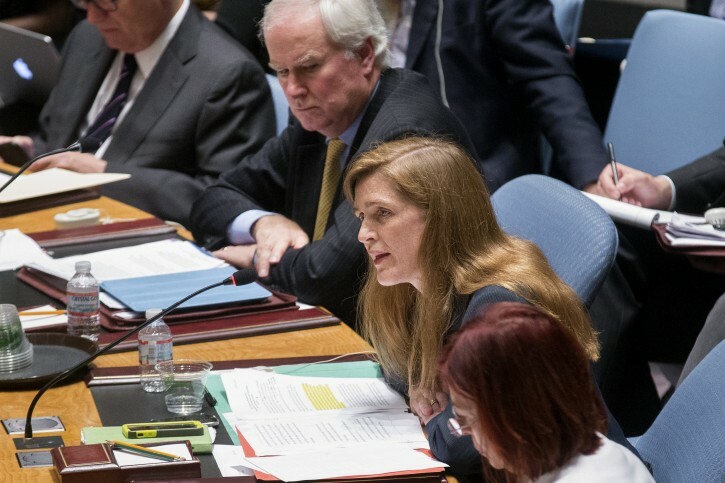 Washington - One day after a passenger jet was shot out of the sky, Samantha Power took her seat at the United Nations Security Council and angrily began building the Obama administration’s case against separatists in eastern Ukraine and their Russian benefactors. Her 13-minute remarks were both emotional and blistering, a combination that has become a trademark during her year as the American ambassador to the U.N. Power choked up when noting the three infants who were among the 298 people killed in the crash and paused for several seconds to compose herself. And she left little ambiguity as to whom the U.S. believes is ultimately responsible for the downed plane. “Russia can end this war. Russia must end this war,” Power declared in the emergency Security Council session, banging her clasped hands on the table in front of her for emphasis. The episode underscored the journalist and human rights activist-turned-diplomat’s reputation as one of the Obama administration’s most outspoken advocates for aggressive action on the world stage. Yet as Power’s tenure at the U.N. has made clear, tough talk alone can’t overcome the veto power Russia wields on the Security Council or even guarantee that Power’s boss in the Oval Office will match her strong words with tough action. Power’s response to the downed Malaysia Airlines plane did bring about an increasingly rare result for a member of the Obama administration’s foreign policy team: praise from Republicans. Implicit in some of the Republican praise for Power was of Obama’s more measured initial response to the downed plane. In his first brief statement just hours after the aircraft was felled by a missile, Obama said the incident looked like it “may be a terrible tragedy.” He strengthened his rhetoric the following day when he spoke about an hour after Power’s speech at the Security Council, but was less definitive than his U.N. envoy in pinning blame on Russia and vowing to bring the perpetrators of the attack to justice. Administration officials said any apparent daylight between the president and his U.N. envoy was by design and aimed at giving Obama more maneuverability in the sensitive diplomatic negotiations that would follow the crash. They also said the White House was involved in coordinating Power’s remarks and backed the idea of using the emergency Security Council meeting as the administration’s first opportunity to begin making a public case against Russia and the separatists. Indeed, the White House has turned to Power before to make a case for international action, drawing upon her reputation as a humanitarian interventionist and Pulitzer Prize-winning chronicler of genocides. During her first month as U.N. ambassador, Power became one of the administration’s leading public advocates for military action against Syria in retaliation for its chemical weapons attack on civilians. She spoke passionately about the matter at the United Nations and also delivered a speech in Washington where she argued that diplomatic options had been exhausted. Yet Power and others in the administration were ultimately overruled by Obama, who abruptly scrapped plans for a military strike on Syria in exchange for a plan to strip that country’s government of its chemical weapons stockpile. While administration officials have heralded that effort as a success, the bloody civil war in Syria rages on with few signs of abating. There also are few guarantees that Power’s harsh rhetoric about Russia’s role in Ukraine will lead to any kind of international action to quell the crisis. She has been making strong statements on the situation for months, but there has been little shift in Moscow’s calculus and Russia President Vladimir Putin appears to have only become more aggressive in backing the separatists in eastern Ukraine. People close to Power says she does grow frustrated with the inherent limitations of U.N. diplomacy, with Russia and sometimes China able to act alone to block U.S. priorities. “She believes her job is to represent the lives of average, ordinary people and remind diplomats negotiating abstract, anodyne statements that these debates are about real people,” said Erin Pelton, who worked for Power at the U.N.